Various room acoustic parameters and their optimal values were proposed and verified as proper interpretations to the listeners’ preference of concert hall sounds. However the listening environment has been changed since they were developed, and the listeners’ preference may not be the same among countries of different cultural backgrounds. Actual listeners’ preference should be applied to the design of a new concert hall. A survey on the listening preference was carried out for 22 music experts. A room acoustical design process was proposed which made the acoustical environment of a concert hall as close to the listeners’ preferences. 콘서트홀의 소리품질을 나타내는 실내음향 지표들이 다수 개발되어 있으며, 청취자들이 기대하는 소리에 관한 경험적인 연구의 결과로 각 실내음향 지표들의 적정 범위가 제안되었다. 그러나 세월의 흐름에 따라 연주나 청취환경의 경향이 변하고 있고, 각 지표의 적정 범위에 대해 연구자들의 이견이 존재하는 등의 문제가 드러나고 있다. 콘서트홀의 음향환경에 대해 청취자들이 어떠한 선호개념을 갖고 있는지 조사하고 이를 콘서트홀의 음향설계에 반영하여야 한다. 이 연구에서는 음악의 연주 및 청취에 전문적인 경험을 갖고 있는 우리나라의 청취자들을 대상으로 콘서트홀 음향효과에 대한 선호도를 조사하고 평가하였다. 그리고 그 결과를 반영하여 청취조건을 구현하는 콘서트홀의 음향설계 프로세스를 제안하였다. Adaptive beamforming methods are known to suppress sidelobes and improve detection performance of weak signal by constructing weight vectors depending on the received signal itself. A standard adaptive beamforming like the MVDR (Minimum Variance Distortionless Response) is very sensitive to mismatches between weight vectors and actual signal steering vectors. Also, a large computational complexity for estimating a stable covariance matrix is required when wideband beamforming for a large-scale array is used. In this paper, we exploit the WBRCB (Wideband Robust Capon Beamforming) method for stable and robust wideband adaptive beamforming of a passive large uniform line array sonar. To improve robustness of adaptive beamforming performance in the presence of mismatches, we extract a optimum mismatch parameter. WBRCB with extracted mismatch parameter shows performance improvement in beamforming using synthetic and experimental passive sonar signals. 적응빔형성 기법은 부엽을 줄이고 약한 신호에 대한 탐지 성능을 향상시킨다. MVDR(Minimum Variance Distortionless Response)과 같은 일반적인 적응빔형성 기법은 설계한 가중벡터와 실제 입사신호의 조향벡터의 불일치에 대해 매우 민감하다. 또한 센서 수가 많은 어레이를 이용하여 광대역 적응빔형성을 할 경우 공분산행렬을 산출하기 위해 긴 관측시간과 많은 연산량이 요구된다. 본 논문은 센서 수가 많은 수동 선배열 소나의 광대역 적응빔형성 성능 향상 및 안정성을 위해 WBRCB(Wideband Robust Capon Beamforming)를 적용하였다. 불일치 요소에 강인한 WBRCB 구현을 위해 다양한 불일치 요소를 반영하여 최적의 불일치 파라미터를 도출하였다. 도출된 파라미터를 반영한 WBRCB 기법을 시뮬레이션 및 실험데이터에 적용하여 수동 선배열 소나의 광대역 적응빔형성 성능 향상을 검증하였다. When measuring the radiating noise of an underwater moving source, the range information between the acoustic source and the receiver is an important evaluation factor, and the measurement standards such as a receiver position, a moving source depth and a speed are set. Although there is a method of using the cross correlation as a method of finding the range of the underwater moving source, this method requires a time synchronization process. In this paper, we proposed the method to estimate the range by comparing the Doppler frequency difference of the theoretically calculated multipath signal with the Doppler frequency difference of the multipath signal estimated from the received signal. The proposed method does not require a separate time synchronization process. Simulations were performed to verify the performance, and the ranging error of the proposed method reduced by about 95 % than that of the conventional method. 수중 이동 음원의 방사 소음을 측정하는 경우 음원과 수신기 사이의 거리 정보가 중요한 평가 요소이며, 수신기 위치, 음원의 수심 및 속도 등과 같이 측정 규격이 정해져 있다. 이동하는 수중 음원의 거리를 찾는 방법으로써 상호 상관도를 사용하는 방법이 있지만 이 방법은 송신기와 수신기 사이의 시간 동기화 과정을 필요로 한다. 본 논문에서는 이론적으로 계산된 다중 경로 신호 사이의 도달 주파수 차와 수신 신호에서 추정된 다중 경로 신호의 도달 주파수 차를 비교하여 거리를 추정하는 방법을 제안한다. 기존의 방법과는 다르게 제안한 방법은 시간 동기화 과정이 필요하지 않다. 성능 검증을 위해 모의실험을 수행하였으며, 거리 오차가 기존의 방법에 비해 약 95 % 감소하였다. 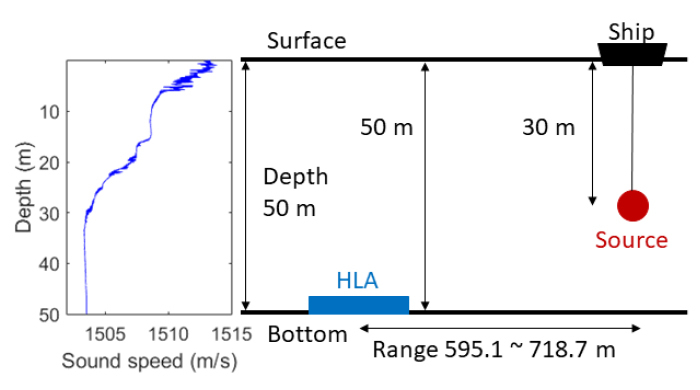 In this paper, the performance verification of an around-view sonar and an excavation depth measuring sonar applicable to track-based ROVs (Remotely Operated underwater Vehicles) for heavy duty work is studied. For the performance verification, an experiment is carried out in a water tank and at sea by attaching the around-view sonar and the excavation depth measuring sonar for a heavy work ROV. In the case of the around-view sonar, image sonars are mounted on ROV in four directions (front, back, left and right) and in the case of the excavation depth measuring sonar, the same kind of MBES (Multi Beam Echo Sounder) is mounted on the front of the ROV. The result of an operation test of the ROV equipped with these sonars shows that the sonar systems are rarely affected by high turbidity due to sedimentation during the operation. In the case of the around-view sonar, it is possible to see rock formation, gravel and sandbank 30 m ahead of the ROV. It is confirmed that the excavation depth can be measured after the ROV has performed the excavation. This experiment demonstrates that the ROV can improve the efficiency of the work by utilizing the around-view sonar and the excavation depth measuring sonar. 본 논문은 트랙기반 중작업용 ROV(Remotely Operated underwater Vehicle)에 적용 가능한 어라운드 뷰 소나 및 굴착깊이 측정 소나의 성능 검증에 대한 내용을 다루고 있다. 현재 국산화 개발 중인 중작업용 ROV에 활용 가능한 어라운드 뷰 소나 및 굴착깊이 측정 소나를 장착하여 수조 및 실해역에서 성능 검증 실험을 수행하였다. 어라운드 뷰 소나의 경우 이미지 소나를 ROV 전후좌우 4방향에 장착하고, 굴착깊이 측정 소나는 멀티 빔 음향측심기(Multi Beam Echo Sounder, MBES) 기술로써 ROV 전방에 장착된다. 본 논문에서 개발한 소나를 장착하고 ROV를 실해역에 진수시켜 소나를 운용한 결과 소나 시스템들은 작업 중 발생하는 침전된 부유물이 발생하거나 탁도가 높은 해역에 영향을 거의 받지 않으며 어라운드 뷰 소나의 경우 ROV 전방 30 m 거리에 있는 암반지형, 자갈, 모래톱 등을 확인할 수 있었다. 그리고 굴착깊이 측정 소나의 경우 ROV가 굴착 작업을 수행 후 굴착 깊이를 측정 가능함을 확인하였다. 본 논문에서 제안한 어라운드 뷰 소나와 굴착깊이 측정 소나를 활용함으로써 작업효율성을 높일 수 있음을 입증하였다. 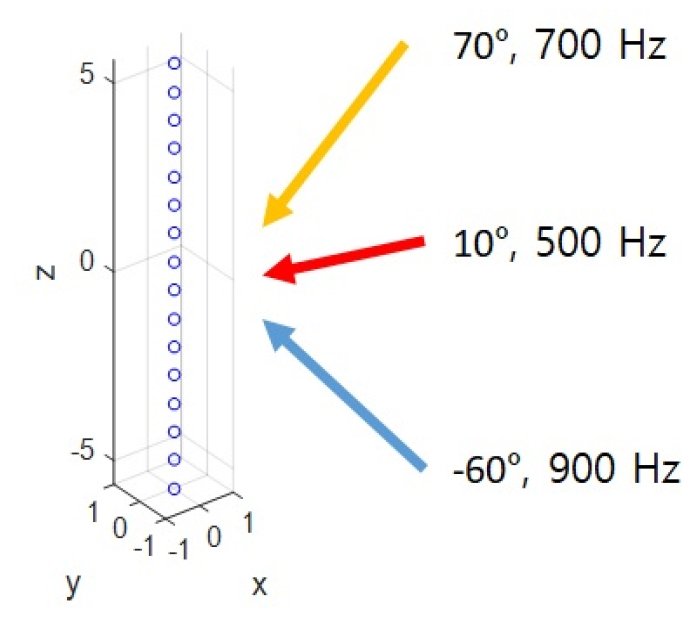 When an array receives a signal with a frequency higher than the design frequency, there is an ambiguity in beamforming due to spatial aliasing. In order to overcome this problem, Abadi proposed frequency-difference beamforming. However, there is a constraint that the minimum frequency bandwidth is required according to the value of the difference frequency. In this paper, we propose a method to find the direction of the target signal with spatial aliasing based on the frequency-wavenumber spectrum combined with Radon transform. The proposed method can estimate the direction of the target without ambiguities when the signal has nonnegligible bandwidth. We tested the algorithm by simulating a broadband signal and verified the results with the frequency-difference beamforming method using SAVEX15 (Shallow Water Acoustic Variability EXperiment 2015)’s shrimp noise data. 배열의 설계주파수보다 높은 주파수의 표적신호가 수신되는 경우 공간 에일리어싱에 의해 빔형성에 모호성이 발생한다. 이를 극복하기 위해 Abadi가 차주파수 빔형성 기법을 제안하였다. 하지만 차주파수 빔형성 기법은 차주파수의 값에 따라 최소한의 대역폭이 필요한 제약조건이 있다. 본 논문에서는 주파수-파수 스펙트럼의 특성과 라돈변환을 이용하여 공간 에일리어싱이 발생하는 표적신호의 방위를 추정하는 기법을 제안한다. 제안된 기법은 대역을 가지는 신호의 주파수 대역 내에서 방위추정의 모호성은 발생하지 않고, 표적의 방위를 추정할 수 있다. 하지만 대역을 가지는 신호에만 적용이 가능한 제약조건이 있다. 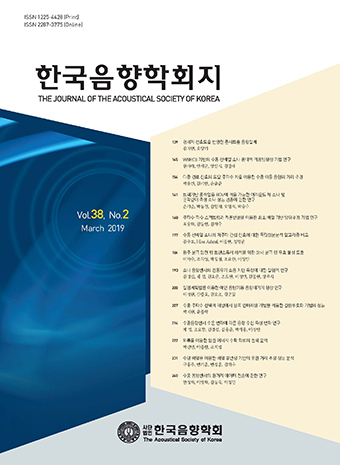 광대역 신호에 대해 시뮬레이션을 수행하여 알고리즘을 구현하고, 이를 SAVEX15 (Shallow Water Acoustic Variability EXperiment 2015)의 딱총새우 소음신호를 이용하여 차주파수 빔형성 기법의 결과와 비교 검증하였다. In this paper, we proposed an application method of ICA (Independent Component Analysis) to passive line array sonar to separate interferences from target signals in low frequency band and compared performance of three conventional ICA algorithms. Since the low frequency signals are received through larger bearing angles than other frequency bands, neighboring beam signals can be used to perform ICA as measurement signals of the ICA. We use three ICA algorithms such as Fast ICA, NNMF (Non-negative Matrix Factorization) and JADE (Joint Approximation Diagonalization of Eigen-matrices). Through experiments on real data obtained from passive line array sonar, it is verified that the interference can be separable from target signals by the suggested method and the JADE algorithm shows the best separation performance among the three algorithms. 본 논문에서는 수동 선배열 소나의 저주파 영역에서 수신된 표적 신호로부터 간섭신호를 분리해 내기 위해 독립성분분석 알고리즘을 적용하는 방안을 제안하고 기존 알고리즘들의 성능을 비교해 보았다. 저주파 대역 신호의 경우 비교적 넓은 방위로부터 수신되기 때문에 인접 빔 신호를 관측신호로 활용하여 독립성분분석을 수행할 수 있다. 신호분리에 사용한 독립성분분석 알고리즘은 FastICA(Fast Independent Component Analysis), NNMF (Non-negative Matrix Factorization), JADE (Joint Approximation Diagonalization of Eigen-matrices)이다. 실측 선배열 수동소나신호를 이용하여 독립성분분석을 수행한 결과 제안한 방법으로 간섭신호분리가 가능함을 확인하였으며, JADE 알고리즘의 신호 분리 성능이 가장 우수한 것으로 나타났다. Compared to 31-mode rings, 33-mode rings are highly utilized as wide bandwidth underwater acoustic transducers because the electro-mechanical coupling and piezoelectric constant d are high. On the other hand, the 31-mode ring is an axial symmetry structure, so it is possible to model it as a simple two-dimensional asymmetrical model for numerical analysis, but the 33-mode ring requires a three-dimensional numerical analysis. That is, a lot of computing resources and computation time are required. 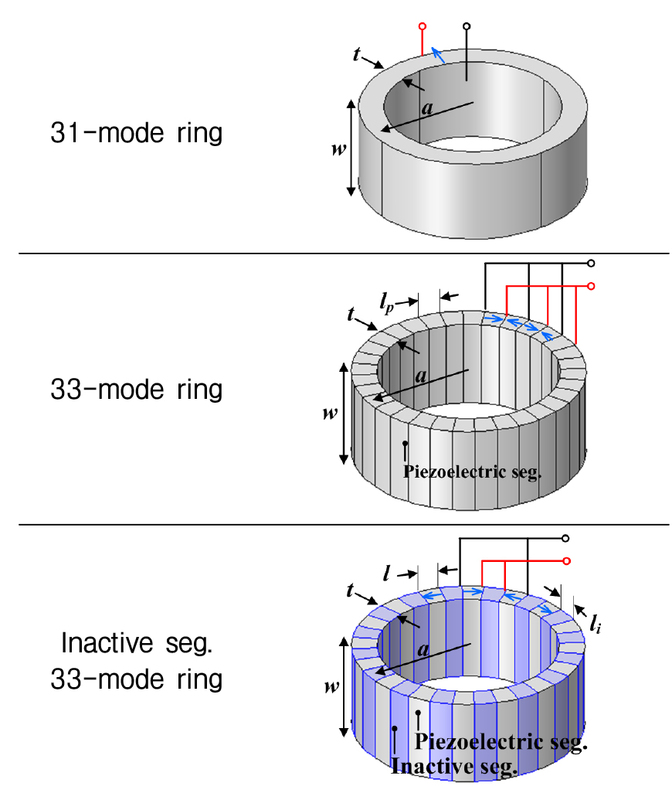 In this study, the effective material properties of an equivalent 31-mode ring were derived to simulate the electro-mechano-acoustical responses of the 33-mode ring transducer. Using the effective material properties derived from this study, a numerical analysis of rings in vacuum, air backed rings in water, and FFR (Free Flooded Ring) transducers were performed to compare the responses of 33-mode rings. 33-모드 링은 31-모드 링에 비하여 결합상수와 압전상수 d가 높기 때문에 광대역 수중 음향 트랜스듀서로 활용성이 높다. 반면 31-모드 링은 축대칭 구조이므로 수치해석 수행시 2차원 축대칭 모델로 간략히 해석이 가능하지만, 33-모드 링은 3차원 수치해석을 수행해야 한다. 즉, 특성 예측을 위해 많은 전산자원과 계산시간이 소요된다. 따라서 33-모드 링의 전기-기계-음향 응답을 모사할 수 있는 등가의 31-모드 링의 유효 물성을 도출할 수 있다면 소나 트랜스듀서 설계 등에 실용적일 것이다. 본 연구에서는 응답 특성을 모사하기 위해 각 링의 전기, 기계 임피던스 및 변환계수()가 동일하다고 가정하여 등가 31-모드 링의 유효 밀도(ρ31-eff), 컴플라이언스(s11-effE), 압전 상수(d31-eff), 유전 상수(ε33-effT)를 유도했다. 도출한 유효 물성을 이용하여 진공상태의 링, 수중에서 공기 배킹의 링, 그리고 수중에서 링 내부에 자유롭게 유체가 드나드는 링에 대하여 수치해석을 하였고 이를 33-모드 링의 응답특성과 비교하였다. 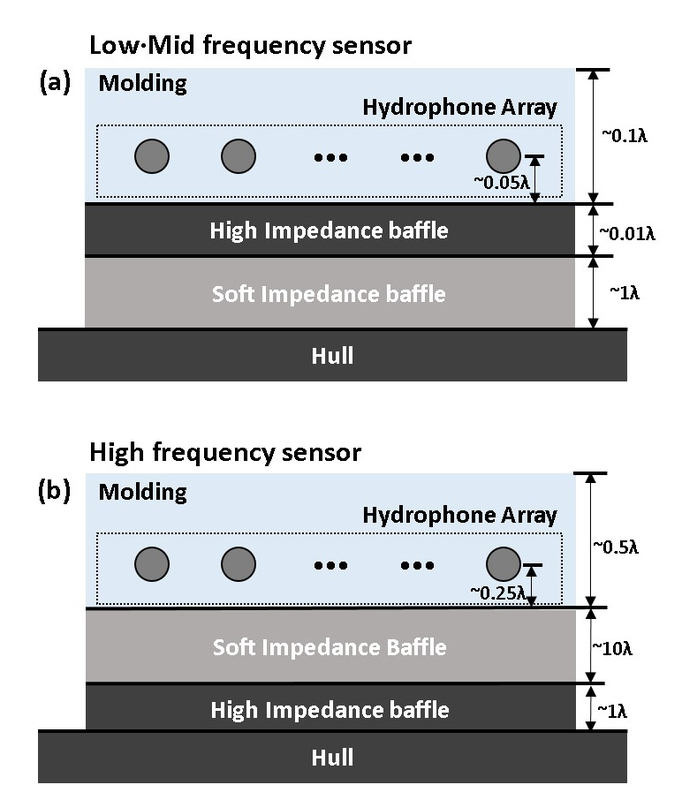 In this paper, the results of underwater vibration experiment are analyzed to verify platform vibration-induced noise isolation characteristics of a hull-mounted acoustic sensor. 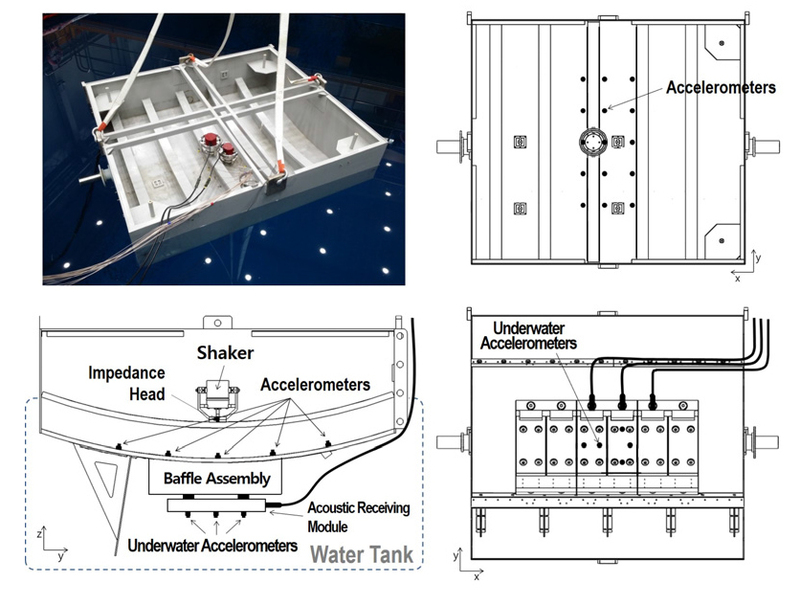 The experimental condition causing platform vibration-induced noise is generated using the mock-up hull, where the acoustic sensor is installed, with shaker in an acoustic water tank. The performance indices of ATF (Acceleration Transfer Function), AVS (Acceleration Voltage Sensitivity), and IL (Insertion Loss) for the acoustic sensor are calculated from the output of the standard accelerometers, which are installed on the mock-up hull and the acoustic sensor, and the output signal of the acoustic sensor. 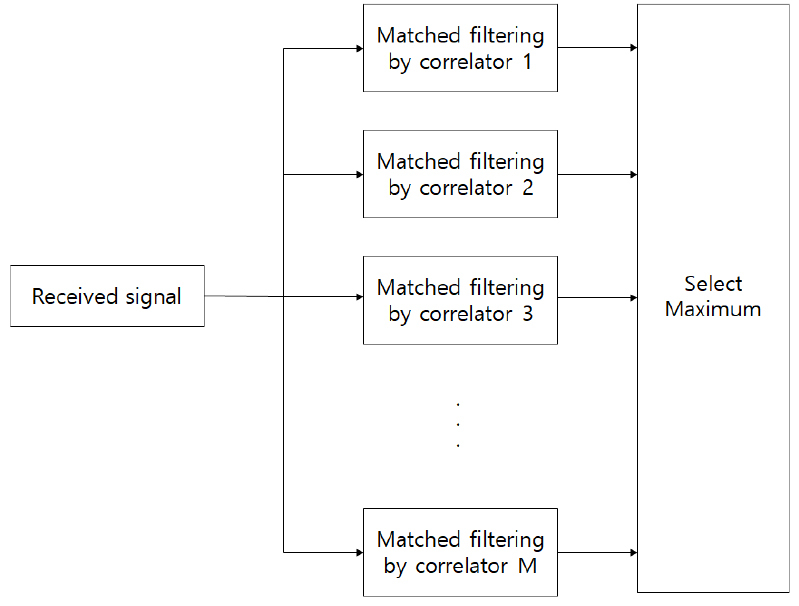 The frequency-dependent noise isolation characteristics of the acoustic sensor are analyzed based on the calculated performance indices and an effectiveness of the experiment is examined. 본 논문에서는 선체부착형 음향센서의 플랫폼 진동유기 소음 차단 특성을 확인하기 위한 수중 진동 실험을 수행하고 결과를 분석하였다. 음향수조 환경에서 음향센서가 설치된 선체모사구조물과 가진기를 이용하여 플랫폼 진동유기 소음 조건을 구현하였고, 선체모사구조물 및 음향센서에 설치된 표준 가속도계와 음향센서의 출력신호 측정을 통해 음향센서의 진동차단율, 삽입손실 및 진동민감도와 같은 성능지수를 산출하였다. 산출된 성능지수 결과를 토대로 음향센서의 주파수별 소음 차단 특성을 분석하고 실험 기법의 유효성을 검토하였다. In this paper, the characteristics of receiving voltage sensitivity about acoustic package in towed array sonar is analyzed through the numerical simulation and design of experiments. Simulation results show that the variation of receiving voltage sensitivity is caused by the structural resonance mode shape on baseline acoustic package. The effect of design parameters of the acoustic package are analyzed through the design of experiments to reduce the deviation of receiving voltage sensitivity. A change of hydrophone shield can thickness (t) is the greatest effect on the deviation of receiving voltage sensitivity. As a result of water tank test, the acoustic package derived from the design of experiments has reduced deviation of receiving voltage sensitivity. 본 연구에서는 예인 음탐기용 음향패키지에 대한 수신전압감도 특성을 분석하기 위해 수치해석과 실험계획법을 적용하였다. 수치해석 결과는 초기 설계된 음향패키지의 구조 공진 모드 특성으로 인한 수신전압감도 변화를 보여준다. 수신전압감도 편차를 줄이기 위해 도출된 음향패키지 설계 변수의 영향은 실험계획법을 통해 분석하였다. 수신전압감도 편차는 수중청음기 쉴드캔 두께(t)의 변화에 가장 민감한 것을 확인하였다. 수조시험 결과 실험계획법에 의해 도출된 음향패키지는 수신전압감도 편차가 감소됨을 확인하였다. In this paper, we evaluate the communication performance of convolutional code with block interleaving in a frequency-selective channel. Block interleaving is a technique for spreading and rearranging digital data streams. A block interleaving technique is applied to improve the performance by dispersing the concentration of burst errors in a frequency-selective channel. As a result of evaluating the performance of the convolutional code with block interleaving in the water tank experiment, There was no difference in the performance of convolutional codes using block interleaving in a frequency-selective channel. However, in the frequency-selective channel, the convolutional code with block interleaving has a gain of 2 dB, and it is confirmed that the underwater acoustic communication performance is improved. 본 논문은 수중 주파수 선택적 채널에서 블록 인터리빙 기법을 적용한 길쌈부호기법의 통신성능을 평가하였다. 블록 인터리빙은 디지털 데이터 열을 확산 분산하고 재배치하는 기법으로 주파수 선택적 채널에서 연집오류(burst error)의 집중을 분산시켜 성능을 향상하게 시키는 기법으로 블록 인터리빙 기법이 적용되고 있다. 수조 실험에서 블록 인터리빙이 적용된 길쌈부호의 성능을 평가한 결과 주파수 비 선택적 채널에서 블록 인터리빙을 적용한 길쌈부호의 성능의 차이가 없었다. 하지만 주파수 선택적 채널에서는 블록 인터리빙이 적용된 길쌈부호가 길쌈부호보다 2 dB 이득이 발생하였으며, 이로 인해 수중 음향 통신 성능향상에 기여함을 확인하였다. 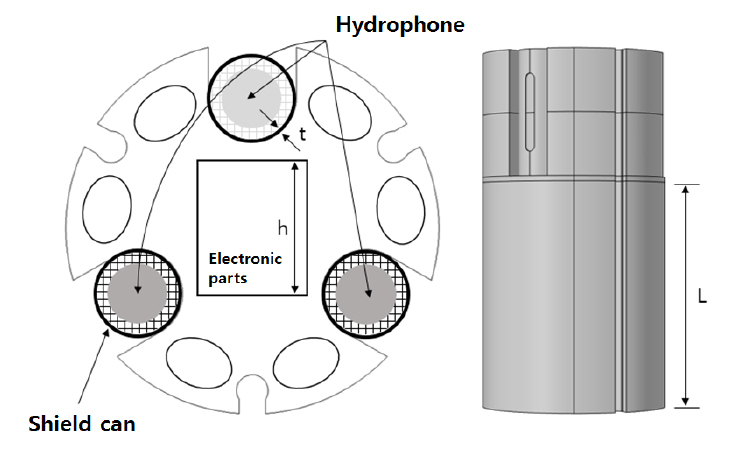 In this paper, a temperature dependent acoustic receiving characteristics of underwater acoustic sensor is studied by theoretical and experimental investigations. Two different types (lowmid frequency sensor and high frequency sensor) of underwater acoustic sensors are designed with different configuration of baffle and conditioning plate. The temperature dependent characteristics of the acoustic sensors are investigated within the temperature range from –2 °C to 35 °C. The material properties of the piezoelectric ceramics, molding and baffle, which are the primary materials of the acoustic sensors, are measured with temperature change. The temperature dependent RVS (Receiving Voltage Sensitivity) characteristics of the acoustic sensors are simulated by using the measured material properties. The RVS changes of the acoustic sensors are measured by changing temperature in the watertank where the acoustic sensors are installed. The measured and the simulated data show that the temperature dependent characteristics of the acoustic sensors are mainly dependent for the sound speed changes of the molding material. 본 논문은 수중음향센서의 수온 변화에 따른 음향 수신 특성 변화를 이론적, 실험적 방법으로 확인하였다. 반사판 및 배플 구성에 따라 중․저주파용 및 고주파용의 두 가지 음향센서를 설계하여 –2 °C ~ 35 °C의 온도범위에서 온도 변화에 따른 음향 수신 특성을 각각 분석하였다. 음향센서 주요 구성 소재의 온도별 물성치 변화에 대한 영향성을 분석하기 위하여 압전세라믹, 몰딩 및 배플 시편의 온도별 물성치 변화를 측정하였고, 측정된 물성치를 활용하여 온도별 수신감도(Receiving Voltage Sensitivity, RVS) 변화를 유한요소해석 기법을 통하여 해석하였다. 제작된 두 가지 음향센서의 온도별 수신감도 특성을 측정하기 위하여, 내부 수온 및 수압 조정이 가능한 압력 챔버에 음향센서를 설치하고 챔버 내부 수온을 변화시켜가며 수신감도를 측정하였다. 측정 및 분석결과 수중센서의 온도별 수신감도 특성은 몰딩 재료의 음속변화에 주도적으로 영향을 받는 것을 확인하였다. 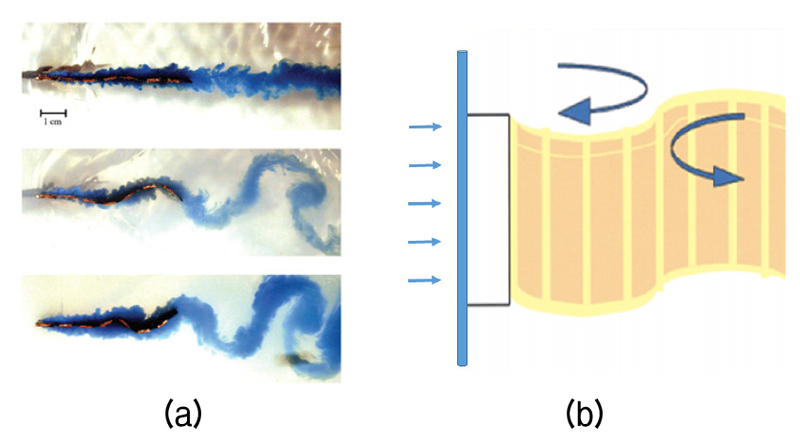 In this paper, the power of the energy harvesting circuit using the PVDF (Polyvinylidene fluoride) piezoelectric sensor transformed by vortex was analyzed. For power analysis, a general bridge diode rectifier circuit and a P-SSHI (Parallel Synchronized Switch Harvesting on Inductor) rectifier circuit with a switching circuit were used. The P-SSHI circuit is a circuit that incorporates a parallel synchronous switch circuit at the input of a general rectifier circuit to improve energy conversion efficiency. In this paper, the output power of general rectifier circuit and P-SSHI rectifier circuit is analyzed and verified through theory and experiment. It was confirmed that the efficiency was increased by 69 % through the experiment using the wind. In addition, a circuit for storing the harvested energy in the supercapacitor was implemented to confirm its applicability as a secondary battery. 본 논문에서는 유체의 와류 현상을 이용한 에너지 하베스팅 회로의 전력을 분석하였다. 와류를 전기 에너지로 바꾸기 위한 소자로 PVDF (Polyvinylidene fluoride) 압전 센서를 사용하였으며, 전력 분석을 위해 잘 알려진 브리지 다이오드 정류 회로와 전력 변환 효율을 향상시키기 위해 다이오드 정류회로 입력단에 병렬 동기 스위치 회로를 접목한 P-SSHI(Parallel Synchronized Switch Harvesting on Inductor) 정류 회로를 사용하였다. 다이오드 및 P-SSHI 정류 회로의 출력 전력은 이론을 통해 분석하였고 실험을 통해 검증하였다. 공기에 의한 와류를 이용한 실험을 통해 P-SSHI 정류 회로의 전력효율이 69 % 증가됨을 확인하였다. 또한 수확된 와류 에너지를 슈퍼 커패시터에 저장하는 회로를 구현하여 2차 전지로써 활용이 가능함을 확인하였다. In sonar systems, the passive ranging of a target is an active research area. This paper analyzed the performance of passive ranging based on an array invariant method for different environmental and sonar parameters. The array invariant developed for source range estimation in shallow water. The advantages of this method are that detailed environmental information is not required, and the real-time ranging is possible since the computational burden is very small. Simulation was performed to verify the algorithm. And this method is applied to sea-going experimental data in 2013 near Jinhae port. This study shows the performance of ranging for source orientation, transmission signal length, and length of a receiver through numerical simulation experiments. Also, the results using nested array and uniform line arrays are compared. 소나 체계에서 표적의 거리를 수동으로 추정하는 방법은 활발히 연구되고 있는 분야이다. 본 논문은 배열 불변성을 기반으로 여러 환경과 소나 매개변수에 따른 거리 추정 성능을 제시한다. 배열 불변성은 천해에서의 음원 거리 추정 기법으로서, 상세한 환경 정보가 불필요하며 연산 량이 적어 실시간 거리 추정이 가능하다는 장점을 가진다. 본 논문에서는 기법의 성능을 확인하기 위해서 모의실험을 수행하였고, 2013년 진해항 인근에서 수행된 해상실험 데이터에 본 알고리듬을 적용하였다. 본 연구는 모의 실험을 통하여 음원의 방위각, 송신 신호의 길이, 그리고 수신 배열의 길이에 따른 거리 추정 성능을 보여준다. 또한, 네스티드 배열과 균일 선배열에 대한 거리 추정 결과를 비교하였다. This paper is a study result on long distance transmission of underwater acoustic sensor data over cable. The data transceiver is designed using the LVDS (Low Voltage Differential Signaling) transmission scheme, and the jitter characteristics are analyzed by measuring the long distance transmission signal through the cable. In order to reduce the jitter, a pre-emphasis technique is applied to compensate the transmitting signal to be attenuated by long distance transmission, and the transmission characteristics were verified according to the distance. 본 논문은 수중 음향센서 데이터의 원거리 케이블 전송에 관한 연구 결과이다. LVDS(Low Voltage Differential Signaling) 전송 방식으로 설계된 데이터 송수신기의 케이블에 대한 원거리 전송 신호를 측정하고 지터 특성을 분석하였다. 지터 특성을 저감하기 위하여, 원거리 전송에 따라 감쇠될 송신 신호를 역 보상하는 고역 강조(pre-emphasis) 기법을 적용하였으며, 전송 거리에 따라 송신 특성을 검증하였다.